Euphorbia helioscopia, Sun spurge, 5 x enl. Born in a small village in the Harz mountains, Karl Blossfeldt acquired an intimate knowledge of the structures of plant life and the effects of seasonal change on his childhood environment. This close observation laid the foundations for his later work. Originally apprenticed as a decorative cast-iron worker, he was sent to study at Berlin's Royal Museum of Arts and Crafts after his exceptional talent in drawing plant-like decorations for railings and gates became apparent. In 1890 he assisted Professor Moritz Meurer, who had been commissioned by the Prussian Ministry for Science, Art and Education, in compiling a collection of natural forms which could be used in artistic and architectural design. In 1899 Blossfeldt took up a teaching position at the Academy of Konigliches Kunstgewerbemuseum and began photographing plant life. 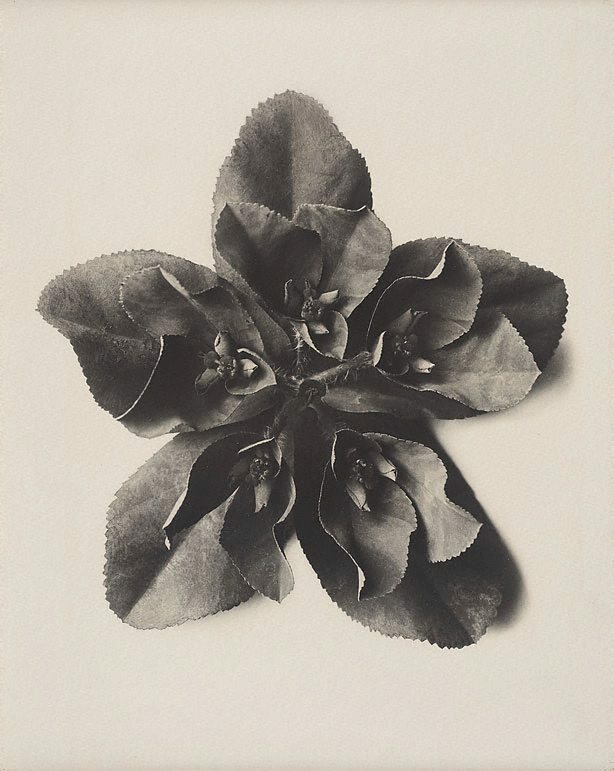 He produced a comprehensive photographic portfolio of botanical specimens intended mainly as educational material to re-invigorate the study of design, which he thought had been stultified by the machine age. The 'eternal, inexhaustible' source of inspiration for good design lay, for Blossfeldt, in the predetermined forms of nature which he photographed with exacting precision. Blossfeldt's concentration on the surfaces, structures and textures of plants came to be regarded as a variation on 'Neue Sachlichkeit', or New Objectivity, which prevailed in German photography of the inter-war Weimar period. The exponents of New Objectivity were opposed to the romanticism of pictorial photography and the technical manipulation of negative and print to alter photographic 'truth' in favour of atmospheric and emotive effects. Walter Benjamin considered Blossfeldt, together with Atget and August Sander, as guardians of photographic objectivity who rejected the false aestheticisation of their contemporaries. For Benjamin, Blossfeldt's photography 'brought out the forms of ancient columns in horsetails, the bishop's staff in a bunch of flowers, totem poles in chestnut and acorn sprouts enlarged ten times, gothic tracery in teasel', thus revealing an 'optical unconscious'. More conservative critics saw Blossfeldt's photographs as a return to lost values and a call for renewed artistic focus on nature rather than mechanisation. Blossfeldt himself considered his work as tapping into the sublime and eternal source of creativity which had been the artistic inspiration of past epochs. Karl Blossfeldt, Wundergarten der natur: neue Bilddokumente schöner pflanzenformen , Berlin, 1932, 27. Anthony Bond, Photography: Art Gallery of New South Wales Collection , 'International modernism', pg.93-111, Sydney, 2007, 92 (illus. ), 106 (illus. ).